A 10,000-acre wildfire that began just off a Californian Air Force base continues to spread. And it’s heading closer and closer to the base’s rocket launchpads. Firefighters have been battling a blaze near Vandenberg Air Force Base—which includes launch facilities that send up rockets for NASA, SpaceX, and United Launch Alliance—since Saturday. The fire has already halted one rocket launch. An Atlas V carrying a high-resolution imaging satellite, the WorldView-4, was originally set to launch last week. 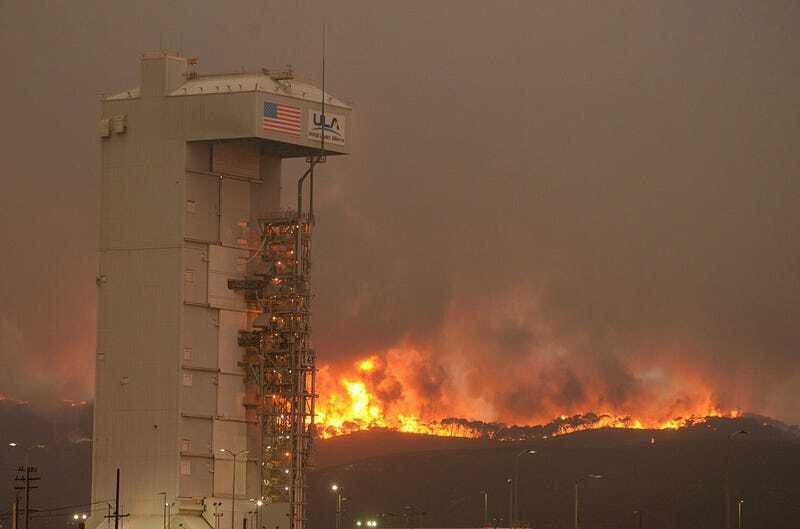 The launch was scrubbed on Sunday as the fire spread, although United Launch Alliance still hoped that they might be able to launch in the next couple days once the blaze had been put down. At the time, the fire was only 500 acres. As of today, it’s spread to 10,000 acres, and pushed closer to the South base, where the launch facilities are. Parts of the base have also lost power as the fire takes down lines in the areas. United Launch Alliance told Gizmodo that they were pushing the launch off until at least Monday, but that they had no current plans to attempt to move the rocket offsite. As a precaution, though, the base has evacuated non-emergency personnel from the launch facilities. Firefighters will keep trying to halt the blaze—which Vandenberg says is now 18 percent contained—from spreading any closer.